April 30 (UPI) — NASA scientists conducted the longest flight of the Operation IceBridge mission’s spring campaign this week. On Friday, the space agency shared a photo captured during the flight. The image features a ridge in Greenland dividing a pair of glacial valleys. The deep blue of a fjord and the Arctic sky interrupt the snow-capped mountains. The most recent Operation IceBridge flight lasted 8.5 hours, allowing scientists to collect data on several glaciers and other points of interest. The IceBridge mission is the largest airborne polar survey yet undertaken. Flights over Greenland will continue through May. In October and November, scientists will survey Antarctica. 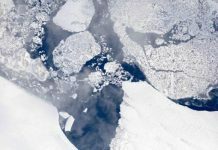 Previous research has shown temperatures are rising at accelerated rates in the planet’s polar regions, causing glaciers to recede and sea ice to shrink. Climate scientists and glaciologists are working to better understand these trends so they can more accurately predict how climate change will sea level rise, as well as an array of related weather and ocean systems.